I always chuckle when I think about the 1939 Bagley... as it always reminds me of "bag-lady". 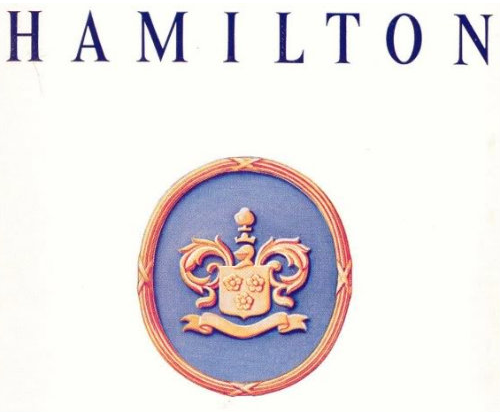 How Hamilton chose the names for it's watches is a mystery to me but someone named Bagley must have been special to someone high up in the marketing ranks. Anyway, the Bagley was introduced in 1939 and produced for three years. Like several other models from the same period, the Bagley featured tubular lugs. Other models with tubular lugs include the Dodson, Sutton and Bowman - to name just a few. 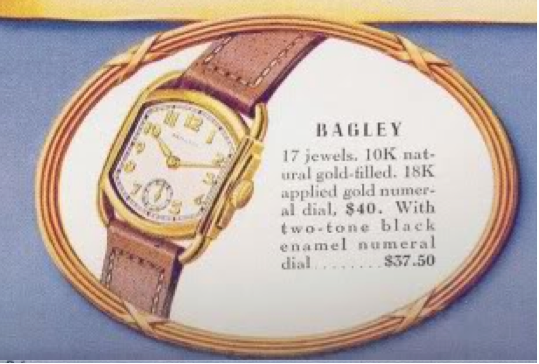 The Bagley is somewhat unique it that it has a fairly pronounced tonneau-shaped dial and crystal. A Tonneau is kind of like a barrel on it's side with flat sides and rounded top and bottom. The 10K gold filled case came only in yellow. It's very prone to wear through at the top and bottom of the crystal and on the corners near where the tubes join the case. Getting a Bagley with a nice case is a real challenge. Under the hood you'll always find a 6/0 sized 987A movement. The watch came with a choice of two dials... the AGN version shown in the catalog image above or a two-tone enamel dial. Personally, the AGN dial just doesn't do anything for me but I do really like the enamel dialed variant. As such, I only have an enamel Bagley to show you, as I doubt I'll ever try to purchase the AGN version. And just to show you the typical wear-thru pattern, there's my Bagley with a somewhat worn case before I upgraded to a better one. Love this watch. Just got a Bagley with AGN and can't bear to have you diss it :) Love them, too. 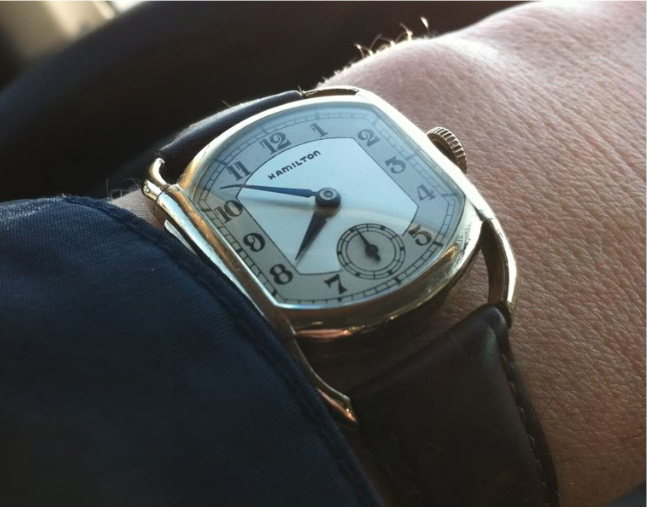 Great to find this site as it has helped me to identify my husband's grandmother's watch which I wear... now I know it is an AGN Bagley from 1939. Luckily it has not suffered too much wear on the case. 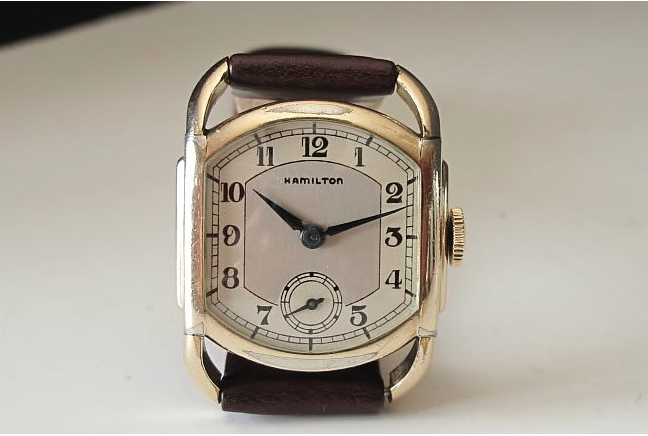 Sorry you don't find the design that inspiring but thanks for putting all this information on your website... particularly as I had not managed to gain much info from UK sources other than Hamilton was regarded as a very good watchmaker. The "Bagley" may, in my humble opinion, be the most attractive of the tubular lug Hamiltons. I believe that it was because of the tonneau design.